John Toogood is a man who likes his work, and he is on his way to seeing his ambition fulfilled when the choices someone else makes leaves John without a job. It isn’t that John thinks Nick Dymond was wrong to marry Phoebe Sparks (Sweet Disorder); it’s just that John was unprepared for the effect of that decision on him. He accepted the position as valet to Nick at the request of the Countess of Tassell, Nick’s mother, expecting to return to the service of Nick’s older brother Stephen, Lord Lenfield, whose political ambitions offered more scope for a skilled valet. John did not expect the countess’s displeasure over Nick’s marriage to lead her to blacklist him among men within her circle of influence. Since Nick can no longer afford to pay a valet’s salary, John is jobless. Needing a place to stay, he rents the rooms formerly occupied by the newly married Phoebe Dymond, despite the fact that he finds disturbing his awareness of Sukey Grimes, the audacious maid who cleans the rooms—and not very efficiently in John’s opinion. Sukey Grimes (and I feel certain Lerner intended readers to chuckle at that name for a character who cleans haphazardly) and John have little in common. Their attitude toward their work is different, their upbringing was different, their status in servants’ hierarchy is different, and there is an eighteen-year age difference between forty-year-old John and the younger maid. Sukey’s philosophy is that one should do just enough work to get paid. She wants to make enough money to support herself, maintain her independence, and prove wrong her mother’s prediction that Sukey will end up in the workhouse. She is amused by John and just as aware of his attractions as he is of hers. Regardless of the mutual attraction, John fears taking advantage of Sukey, and their early relationship can be described as a flirtatious friendship with an adversarial edge. But circumstances change. When John is offered a job as butler in a vicar’s household contingent upon his being a married man, he asks Sukey to be his wife and part of his staff. Sukey is not in love with John, and she is not interested in marriage to anyone. She has a very negative view of the institution. But when she needs a job, John’s proposition becomes more appealing. Can these two very different people make a success of their new jobs and their new marriage? Lerner also uses her impressive research skills and commitment to historical accuracy to give her readers not a backdrop but a world—a world very different from the usual one of ballrooms, house parties, curricle races, and gentlemen’s clubs but no less dimensional and detailed for all its differences. She's been lonely and afraid, young and inexperienced, and he'd used it to talk her into a marriage that she'd turned down when she had a job. The more he wanted her, the more he needed her, the more he asked her for - the less chance she would have to be the woman she'd wanted to be, who stood on her own two feet, who had nothing between her and the sun. The less chance she'd have to discover what she really wanted. He'd been collecting his burdens for forty years. Even if they'd grown heavy for him, she was too young to be asked to shoulder half. Lerner minimizes neither the personal nor the job-related obstacles in their relationship. Love is messy and difficult and challenging as often as it is exhilarating and comforting, and transcendent. This story recognizes that truth. 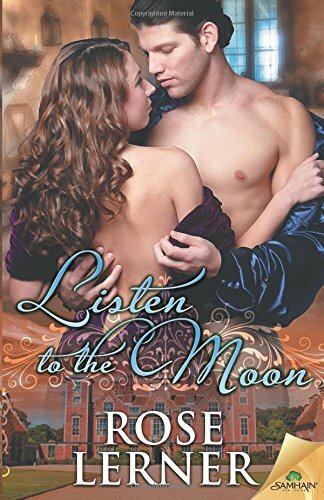 If you like romances that are unconventional, if you like to see a relationship develop as the H/H change and grow, if you are a Downton Abbey fan, or if you just long to read a story that pulls you into its world, add Listen to the Moon to your TBR immediately. I highly recommend it. Like you, Janga, I'm a huge fan of Rose Lerner's books. I'm just starting Listen to the Moon! have not read any Rose Lerner books. Going to go 1 click this one. I loved In For a Penny. I've got a couple more of hers on my kindle. I need to catch up!